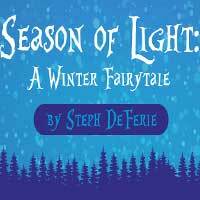 Season of Light: A Winter Fairytale, by Steph DeFerie, is a fun and uplifting holiday play about doing good and bringing light into the world. Magda is chosen to play the Sister of the Sun for her village's Winter Solstice ceremony. But when the days keep growing shorter, Magda is blamed and exiled. In the forest, a group of players join her quest to bring back the light by going to the source: the real Sister of the Sun. What is Magda willing to sacrifice to save the world from darkness? Silver Spring Stage celebrates the holiday season with a special treat for the whole family.